Smart Allergy Friendly Education: Earth Balance Sweet Cinnamon Spread ~ What a delicious dairy-free choice! 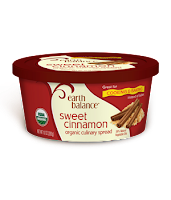 Earth Balance Sweet Cinnamon Spread ~ What a delicious dairy-free choice! 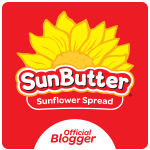 A few weeks ago, I came across a new cooking and baking butter spread alternative. Just on toast alone, it's great! Can't wait to bake some cookies with it! 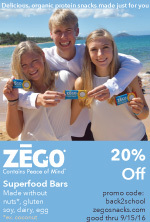 My kids LOVE this product, another great option from Earth Balance. It's lactose-free, gluten-free, dairy-free (although it's NOT stated on the packaging in those terms), and parve (with the circle U symbol - meeting dairy-free standards by the Orthodox Union)! It is also USDA CERTIFIED ORGANIC. Add in being egg-free and nut-free, and it's a HUGE GO for this home. earth balance organic culinary spread, owned and distributed by EARTH BALANCE, a division of GFA BRANDS, INC., Niwot, CO. Ingredients include: palm fruit oil*, soybean oil*, sugar*, filtered water, salt, cinnamon*, crushed soybeans*, natural flavors, soy lecithin*, lactic acid and naturally extracted annatto* for color. For more information, contact: Earth Balance or call 201-421-3970. Their product site is so easy to navigate. You can even pull up the 'nutrition' facts of the products right from the page. How great is that for those who are ingredient focused! Give them a call if you have ANY questions about their ingredients. I did - and the customer service representative I spoke with was sensational. Polite, knowledgeable and professional. The fact that she was from North Jersey made me feel even more at home, being a Philly girl myself. I asked about whether this product was also 'dairy-free' and where was the 'lactic acid' derived. She informed me that ALL earth balance products are dairy-free... and the 'lactic acid'? - derived from sugar beets! Once again, Earth Balance has another product we absolutely love. Now to try out their Coconut Spread. Any opinions out there?